Sealcoating not only beautifies your investment in your asphalt pavement, but sealcoating also more than doubles the life of the pavement. You must sealcoat to protect the asphalt from ultraviolet light, water penetration and chemical attack. 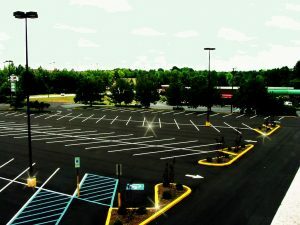 If the asphalt is left untreated and never sealcoated the oxidation of the pavement will begin which causes the asphalt to dry and become brittle and this leads to the erosion of the top layer and the appearance of larger stones and small cracks on the surface. Sealcoating per manufacturer’s instructions costs substantially less than the amount of dollars spent to repair or replace damaged asphalt. As mentioned above, sealcoating also beautifies your asphalt pavement. A nice deep black sealcoat finished with crisp marking paint adds to the attractive appearance of your property. Asphalt pavement cracks are open doorways for water to seep and cause deeper structural damage. Cracks permit the asphalt base to be saturated and thereby cause more cracks through the expansion and contraction experienced in winter months. Also problematic is that cracks allow the base to be washed away, thus causing the surface to be unsupported this leads to even larger problems, for instance pot holes. Needless to say, cracks that are filled with hot crack fill close the doors and lessen this entire process of pavement failure. As neglected asphalt continues to weaken, water and weather damage reduce the life of your asphalt by as much as 50% in just five years.